Ballinlough recorded their first A-League win in a year, with an impressive victory over local rivals Cortown on Sunday, in sunny conditions in Kilskyre. Ballinlough took the lead from the offset, when Kevin Devine converted an early free after Ronan McGuinness had been fouled in front of goal. The lead didn’t last long however, as the talented Ryan O’Rourke scored successive points for the visitors to see them edge in front. The return of Lorcan Maguire at centre back for the ‘Lough has added a level of stability in the home side’s defence, which soon came to the fore, as Cortown struggled to build any meaningful forward play for the remainder of the half. Cortown struggled to deal with the speed and power of the Ballinlough forward line, and the home side were soon awarded a penalty when the lively McGuinness was brought down in the area. Jack Tunney was unlucky to see his spot kick go the wrong side of the post with the keeper beaten. However, this seemed to signal the start of a period of dominance by the ‘Lough, and they went on to score 1-4 before the break, without reply from Cortown. McGuinness and Colm Mallen each picked up points from play, as the reliable Devine knocked over a further two frees. Mark McCullen picked up the final score of the half, as he expertly finished to the back of the net, after the Reds young full forward Michael Geraghty showed great tenacity to win a high ball into the area. This left his side leading 1-05 to 0-2 at the break. The second half started with another blow for Cortown, as their influential midfielder Richie Flanagan had to be substituted after picking up an early knock. O’Rourke got the visitors back up and running with a further brace of points, but they never truly looked like overcoming the deficit they faced. Further good work by Geraghty led to another Ballinlough goal, with McGuinness adding the finishing touch on this occasion. 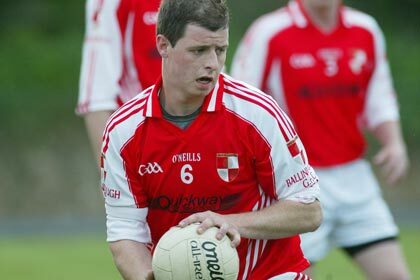 Substitute Johnny Reilly had an immediate impact when brought on, as he split the posts with his first touch. The ever reliable Benji Smith polished off a trademark run from defence with a well taken score shortly after to further extend the home side’s lead. Cortown rallied to produce a spirited finish, scoring three consecutive points, but the last word went to Ballinlough’s Niall Farrelly who fired over two fine late points to cement an eight point victory. While they will be pleased with the result, there is plenty of room for improvement in this Ballinlough side before their next A League fixture against St. Colmcilles next weekend. ﻿Ballinlough:﻿ D. Muldoon, R. Farrell, P. Muldoon, J. Baugh, Colm Mallen, L. Maguire, B. Smith, Cian Mallen, T. McCullen, N. Farrelly, K. Devine, M. McCullen, R. McGuinness, M. Geraghty, J. Tunney. Subs: K. Mallen for J. Tunney, J. Reilly for M. McCullen, J. O’Reilly for K. Devine.